Like a spy that you invite inside your home, if you take Cyborgmatt to Valve Headquarters he’s going to start snooping. Which is exactly what Valve have done, flying the intrepid patch note explorer to Seattle for the International. 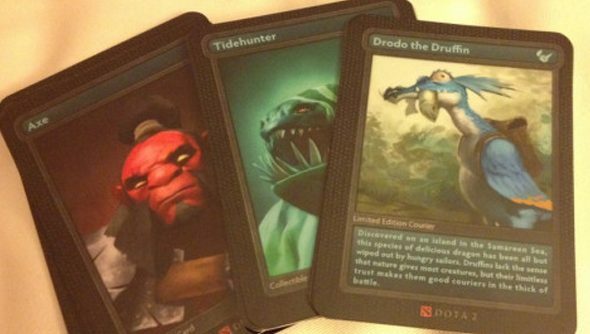 And while he’s there, he’s only gone and snapped some shots of what look like upcoming Dota 2 trading cards. As if I didn’t spend enough time looking at my Dota backpack and sighing forlornly already. As far as I can tell from the two photos that he’s posted up on Twitter, they’re not for a trading card game, as such, and there’s every chance that they’re just a nice internal bit of tat that Valve employees get to enjoy. 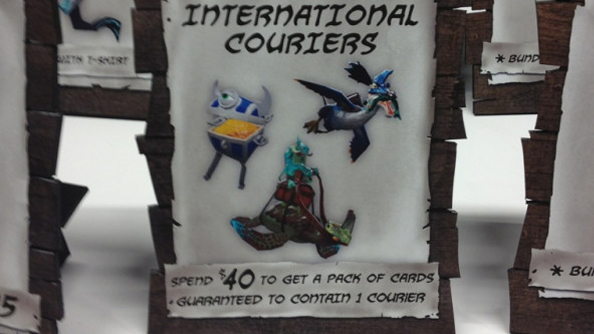 However, there is a second photos with what looks like a shop display sign that states ‘Spend $40 to get a pack of cards guaranteed to contain 1 courier’. Which makes it sound like this isn’t just some internal bit of fun. 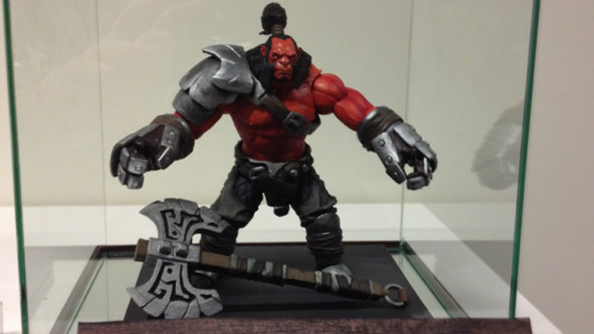 There’s also an Articulated Action Axe, just a prototype, but according to the sign he’ll be headed to shops in Summer 2013. Considering Valve have already made TF2 action figures, that seems pretty believable too. It’s a good thing Dota 2 is free to play, otherwise my wallet might be shrivelling up into a husk right about now.